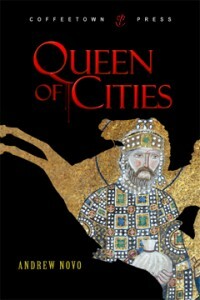 Queen of Cities ($18.95, 318 pages, 6×9 Trade Paperback, ISBN: 978-1-60381-076-0) is a historical fiction novel by Andrew Novo. 1453: An army is marching. The Turkish sultan Mehmed has declared war on Constantinople. This is an age of armored heroes and high-walled cities, of Machiavellian mistresses and scheming politicians, of religious conflict and the clash of empires. The stone, silk and steel of the 15th century come to life in an epic drama that reverberates in our own time. 1453 – An army is marching. The Turkish sultan, Mehmed, brilliant, and ambitious, has declared war on Constantinople. In Queen of Cities, Andrew Novo evokes an age of armored heroes and high-walled cities, of Machiavellian mistresses and scheming politicians, of religious conflict and the clash of empires. With the scrupulous eye of an historian, the author reveals a city caught in a life and death struggle, targeted for conquest by the world’s most powerful man. The stone, silk, and steel of the fifteenth century come to life in an epic drama that reverberates in our own time. Andrew Novo was born in New York City and completed his doctoral degree in history at the University of Oxford. While studying classical history at Princeton, he was inspired to begin this novel about the fall of Constantinople. He is a specialist in the history of the Mediterranean world, both ancient and modern and works as a researcher and writer for Harvard University. Queen of Cities in his first novel. The transformation began. Gülbahar’s white silk night dress was replaced with thick satin robes of red and green. Her lush black hair was combed out, straightened, and left to caress her throat and shoulders. Jeweled rings sparkled on her hands. Golden earrings draped down her neck which gleamed with an emerald necklace. Finally, Eminé clasped a veil of white silk over her painted lips. Gülbahar looked at the opulence of her appearance, her costume, taking in every detail. Delicate footsteps took her down the corridor towards the Sultan’s apartments. Guards left by Mustafa escorted her. They reached the door to Mehmed’s bedchamber. Gülbahar, fragrant, waved the guards away and entered his room. She moved wordlessly across the floor, a rustle of silk and satin. She smiled. Powder made her face even whiter in the candlelight. She circled Mehmed like a butterfly. He watched her—motionless—as she approached him. She was at his side now, staring over his left shoulder at a map of Constantinople. He covered it quickly. But, just as quickly, she took a sketch for a catapult. And no greater risk for any army, he thought, but only to himself. Before he could reply, she spoke again. “But how will you take it? How will you overcome its immortal walls? How will you scale those towers which strain to the heavens?” She wrapped the words of war in seduction. “I did not have you brought here to discuss tactics,” he snapped. “I will be ready,” he responded, resolving to her and to himself. He pulled away from her hands, now clasped across his chest, attempting to disentangle himself from her provocation. “Do you want the City for me, or for yourself?” he demanded.